Chiding industry peers for making an art out of “but for” measurements of financial results, the chief executive of W.R. Berkley Corp. also said it’s time for the industry to face reality about inefficient operations and needed changes. When catastrophes occur, “we have this ability to back the cat losses out. But ironically, the industry doesn’t seem to back the premium out,” said W. Robert Berkley, Jr. during a second-quarter earnings conference call last week, explaining the “but for catastrophes” logic. “There is a reality. Hail happens every year. Tornadoes happen every year. Earthquakes, hurricanes happen certainly more often than we would like but we cannot ignore the reality when we decide what an appropriate risk-adjusted return is. We cannot back it out of the results just because it’s convenient and it tells us an answer that we would rather have,” he continued. Noting that his company’s combined ratio came in at 94.9 for the quarter, including cat losses and premiums, “I would love to be able to sit here and convince myself that actually it’s more of a 94 or 93.9, if you back out the cat. And if you back out weather altogether, it’s a better number than that. But that isn’t reality,” Berkley said, admitting that he had aired his opinion about this particular pet peeve during prior earnings conferences. “But-for” math doesn’t change reality, Berkley says. Bottom line: “We’re concerned because the industry is not known for its ability to change or to adapt,” Berkley said during last week’s earnings conference. “I mentioned these three topics again for no other reason than we view them as short-to-intermediate term issues that do need to be addressed. These are issues that if they are not addressed, the world will find a way to come up with better solutions,” he warned. As for the company’s bottom line, net income rose 65.2 percent to $180 million in the second quarter, with higher underwriting profits, higher net investment income and investment gains all contributing to the jump and a return-on-equity of 13.3 percent. Pretax underwriting income rose 5.6 percent to $81 million, with the 94.9 GAAP combined ratio for the quarter coming in just slightly better than the 95.1 combined ratio recorded for last year’s second quarter. For the first half, net income rose 49.1 percent to $346.5 million. Year-to-date premiums grew 2.4 percent to roughly $3.3 billion, and the combined ratio for the first-half was 94.8. Overall, second-quarter net premiums written rose 3.8 percent to $1.6 billion, with the insurance segment growing 5.2 percent and reinsurance premiums dropping 12 percent. Contributing to the jump in insurance premiums was a 12 percent increase in premiums for short-tail lines, Chief Financial Officer Richard Baio reported. Berkley later explained that the bulk of that jump related to accident and health business rather than property. Of greater concern to Berkley is the general impact of inflation on loss costs for specialty commercial lines generally—financial inflation and social inflation. “There is growing evidence…that there is an increasing frequency of severity and severity continues to be on the rise. There is growing evidence that we’re living in a more litigious environment and it is undoubtedly the case that it will have an impact on loss costs,” Berkley said in his opening remarks. Of particular concern is the fact the industry has not had to deal with the reality of inflation for a extended period of time—and many of today’s professionals have not had to operate in an inflationary environment at all during the course of their careers. “Many actuaries, many underwriters, many people in other disciplines have never had to think about this” as they determine appropriate prices, terms and attachment points, he said. Keeping with the theme of change and “the industry accepting reality and doing something about it,” Berkley also discussed inefficiencies in the industry. “The numbers of pennies on every dollar premium that are spent on other things than claims are overwhelming. This is not a sustainable reality. 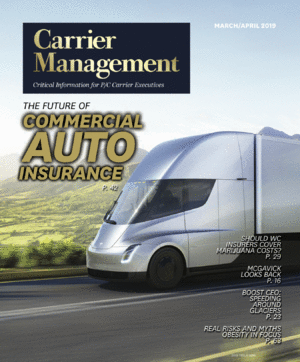 “The combination of acquisition costs and internal costs are not something that society, in our opinion, will be willing to accept long term,” Berkley said, suggesting that a solution won’t be found if carriers keep blaming distribution and distributors keep pointing fingers at carriers. “This is a riddle that will be solved by the two parties working together….But in spite of all the chatter about this throughout the industry, it’s both shocking and disappointing how little has actually changed,” he said. Asked for specifics, Berkley said some efficiency is going to be gained as a result of technology. “When you look at the inefficiencies that exist between the consumer and actually a policy getting issued, when you look at the inefficiencies between a claim occurring and the person actually receiving the funds they’re entitled to, the number of hands, the multiple entry of information—just the path that payments go through [is] just terribly inefficient,” he continued. You’d be “hard-pressed to find [a similar] level of inefficiency” to what exists within insurance underwriting and distribution in any other parts of the financial services segment or in any other industries, he said, broadening his remarks. “And quite frankly, while it’s a little bit of a third rail, you’re going to be a hard-pressed to find a part of financial services, where the customer is paying this number of pennies on the dollar for access to the product,” he said. Noting that true value and service and expertise is sometimes provided in exchange for those pennies, he suggested, however, that “there are a lot of situations where it is just access” that’s being paid for. “That’s not just a distribution issue. That’s a carrier issue [too, and] we need to find ways to work together to be able to do all these things more efficiently,” he said.